Is that free shipping for all your books? 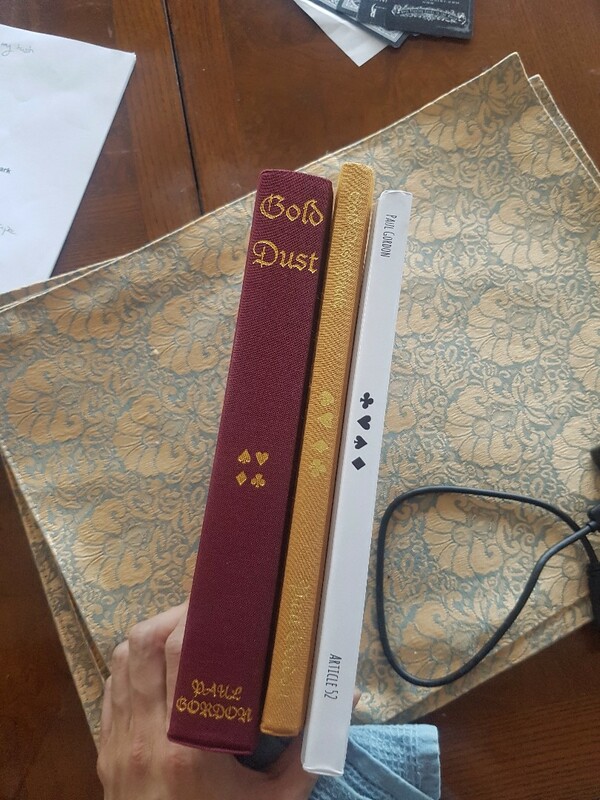 Because I've always wanted your Gold Dust Trilogy. I'd definitely grab article 52 with all the great things I've heard about it as well! Thank you for your kind words. Yes, FREE worldwide shipping for all my books and DVDs....for a few days only. I'll provably grab Quidnunc while I'm at it then! Gonna have to watch the spending, but that free shipping makes getting magic books a lot easier! Just placed my order. That will keep me busy for a veeeeeery long time. Any chance I could get them signed? Unfortunately not because they post from another address. Sorry. No worries. Maybe I'll meet you one day in person and get them signed then hahah. Order placed this morning, Paul! Many thanks indeed...and it's already in the post. These just came in! (still waiting on Quudnunc and one of the Gold Dust books). Yup I saw your email! Just making sure. These will probably keep me busy until at least the end of the year anyway! So you won't be doing any more writing, Paul!